Visits: 91682 persons viewed this recipe. 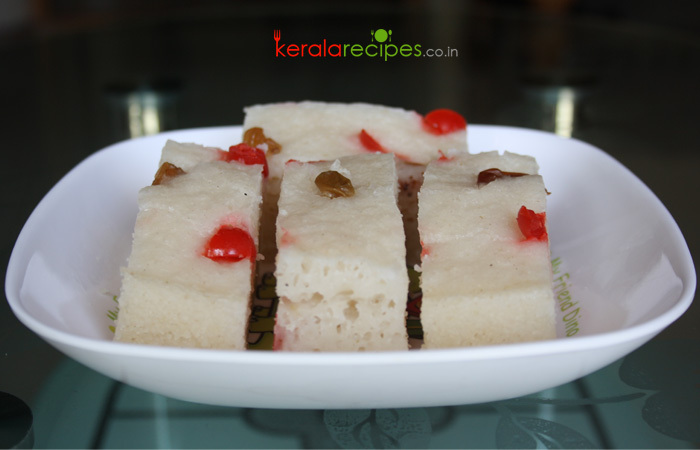 Vattayappam is a kind of steamed rice cake commonly served as a snack or breakfast. The main ingredients of this dish are rice flour and coconut milk. It is one of the traditional-healthy food of Kerala. Vattayappam is prepared especially during Easter and Christmas days. Dissolve yeast in ½ cup of warm water (make sure that the water is not too hot) along with ½ table spoon of sugar and let sit for 30 minutes until it is frothy. Mix 2 table spoon of rice flour with 2 cups of water and boil it for 5 minutes by stirring it. Keep aside and let it cool. Spread evenly gee in a flat pan or an idli mould and pour the batter into it (fill up to half the pan). Garnish it with cashew nut, raisins and cherry (optional). Steam it (like idli) for 20 minutes in a medium heat. (close the lid only after the water starts boiling). When it is done, remove from the flame and let it cool. Cut the vattayappam into desired shapes and serve it with a cup of tea/coffee. 1) As the batter quantity increases during fermentation, use a vessel which can hold almost double the quantity. 2) Fine rice flour is mandatory for vattayappam (You can use idiyappam or appam rice flour, but puttu rice flour is not ideal for this dish). Hi Jayalakshmi, Thanks a lot for trying this recipe and taking time to share your feedback here. Hi… I tried many of your recipe. Its very easy and tasty. Hi Jilby, Thank you very much for trying my recipes and also for your kind words of encouragement, appreciate it very much. Hi Shaan, I tried your recipe in this Easter, Eventhough I have less experience in kitchen it came well. Thank you for the easy recipe. May god bless you with all you want. Hi Radhika, Thank you very much for trying this recipe and also for leaving your feedback here. Nice to know that the Vattayappam came out well for you. Thanks a lot for your kind wishes. Hi Rej, I am really thrilled to see the list of items you tried from this website. Nice to know that you all enjoyed it. I will be posting more easy recipes in the future. Thanks a lot for your inspirational words of encouragement, appreciate it very much. Hi Deepa, Great to know that you all loved it. Thanks for the feedback and regular visit. Hey Shaan, I reached here while searching for Vattayappam recipe and see that your is kinda unique. One doubt i have is should we use roasted rice flour or just regular? Also do you have any suggestions on how to make the batter if using soaked raw rice? Hi Shaan, your recipes looks very simple and so yummy. I tried egg Biryani and its superb. Now I want to make Vattayappam and for that I want to know, for coconut milk i can add coconut milk powder or I have to take milk from the coconut. Hi Raji, Thank you very much for your kind words of encouragement. Great to know that the Egg Biryani came out well for you. Regarding Vattayappam, you can prepare it with coconut milk or finely ground coconut. I haven’t tried it with coconut powder, but I think it will work out. Please do share your feedback. Happy cooking. Good recipe, very authentic. I made with Maggi coconut milk powder. You are welcome Hari. Great to know that it came out well with coconut powder. Thanks a bunch for your feedback. I loved your recipes…. Shaan, your recipes looks very simple and so yummy thanks for sharing. Instead of rice flour and coconut milk, we can also make by grinding rice and coconut. Its only a suggestion. You may please try it and see. Hi Jolly, You are right, we can definitely make Vattayappam by grinding soaked rice and grated coconut. I have tried both the methods, but to make it more quick and easy I choose the steps mentioned here. Thank you very much for the suggestion. Hai Shaan, Thank you so much for your recipe. I tried this recipe too. It was very easy and tasty. Thank you. Hi Merlin, Thank you very much for the regular visit and feedback. I was really thrilled to see the list of recipes you tried from here. Thank you. Hi Sunitha, Thanks a lot for such a nice feedback. Don’t worry about adding garlic in vattayappam, it will enhance the taste. Make sure that you are adding only one clove. I haven’t tried it by adding small onion; please try it and let me know the result. Once again thank you very much for your nice words of encouragement. Hai Shaan, I had tried ur palappam recipe, it came out well. Thanks a lot… but it looks like lite yellow colour! can u tell whatz wrong I had done? Hi Bismin, Thanks for finding time to share your feedback. Sorry, I am not able to find out exact reason for the yellow colour, may be because of the rice flower you used or because of the presence of turmeric in the mixer grinder. Next time you try with another brand of rice flower and wash the grinder well before use. Hai Shaan, your vattayappam recipe is very nice, tasty and so easy. I tried many more times. It is very tasty. THANK YOU for your recipe. Hi, I was just browsing for a good vattayappam recipe. I saw yours and the reviews look good. I use maggi milk powder and I was wondering how much to use?? I look forward to trying a lot more of your recipes. I absolutely enjoy cooking and experiment with new recipes, especially good old kerala ones. I really want to perfect vattayappam. Thanks again. Tried this today! It came out exactly as shown in the picture! My family loved it and it’s all over in few minutes Many many thanks for sharing this recipe and for the neat & clear instructions.. please share more such breakfast recipes suitable for kids. Joythi, Thanks a lot for such great feedback. Happy to know that the vattayappam came out well for you and it was a hit at your place. I will try to include more recipes suitable for children. Once again thanks for your kind words of encouragement. Thank you so much… loved it… may god blesss uuuuu. Thanks a lot for ‘VATTAYAPPAM” receipe. I was actually searching for it and it came out very well. Thank you once again. God bless you. Let me try other recipes also. Uma, Thanks for the feedback. I am glad that you found what you were looking for and it turned out good for you. Hope to see you here often. Thank you for the recipe. I tried it for the first time and it came delicious. Thank you so much for your easy and nice recipe. Hi, Interesting recipe, Can I prepare this without using yeast. Please suggest. Also, let me know if I can use rice flour used to make putu or idiyappam? which one is preferred? Thanks, Nancy. Nancy, Thanks for the comment. It is not possible to do this Vattayappam recipe without using yeast as it requires fermentation. Also fine rice flour is mandatory for this preparation. You can use idiyappam or appam rice flour, but puttu rice flour is not ideal for vattayappam. I tried your recipe, but it didn’t work for me. I had kept the mixture for almost 24 hours to ferment, and when I made it, it was very sour and there was no sweetness, also the mixture had a greyish tinge. Would you have any ideas as to where I went wrong? Look forward to your reply because I really want to get it right because my brother absolutely loves this dish. Merin, The sour taste is because you kept the batter 24 hours for fermentation. It should be around 8 hours. If you use rapid rising yeast it will ferment in 2 hours also, but I recommend the normal one. Regarding the colour of the batter, it will not be pure white but not grey. I think there is something wrong with the yeast you used, but not sure. Hope it will come out well next time. Thanks for the comment. Hello, why we have 2 add garlic a clove? Usually garlic is added? Ligy, Usually people wont add garlic in vattayappam but if you a little will enhance the taste. If you don’t want you can avoid it. Thanks for the comment. Sabi, Thanks for trying the vattayappam recipe. I will try to include the unniyappam and achappam recipes. Hi Chetta Happy Christmas and happy new year. I tried your vattayappam recipe, really it was very tasty, thank you so much for your recipe. I already tried maximum of your recipes (more than 20 recipes). This Christmas also I am going to prepare your chicken biriyani, vattayappam for my family friends. Could you please post some noodles and pasta recipes. God bless you and your family. Sheela, Merry Christmas and Happy new year. I am really glad to know that you tried more than 20 recipes listed here. Thank you very much. I will try to include the recipes you mentioned.